The philosophical subject of Luke Fischer’s poetics aligned with his astounding use of language and form create a poetry born of beauty and existential exploration. In Paths of Flight, his debut collection, the natural world and the internalized world of the poet collide and create a space beyond both. Often, when a poet intends to create the perfect poem technically and structurally, the emotional drive that stimulates the reader can become quickly buried beneath the words, and the balance between quality writing and emotional honesty is undoubtedly a difficult one. Fischer himself ‘regards poetry as a mediation and articulation of truth’, and this book embodies this while still standing as a technically impressive body of work. Fischer’s work has appeared in various places and has been appropriately acknowledged for its beauty and skill, but to categorize this as a “first collection” seems impossible. The poems demonstrate assurance, control, balance and precision, without becoming forced at any time. One of the most interesting aspects of Fischer’s poetry is the approach and careful execution of the work. A highly-regarded scholar, his work is deeply rooted in philosophy, with a focus on the work of Rilke. Fischer’s poems notice aspects both prominent and hidden within the natural and the internal. There are a great many forms taken on, though the imagery that characterizes Fischer’s poetry has a way of pervading his oeuvre. The presence of birds, as the title suggests, is a recurring feature. Much like the work of Robert Adamson, Fischer views the bird as an intelligent, endlessly beautiful creature, despite acknowledging its capacity for violence out of necessity and survival. The image of a ‘feathered-bullet’ to describe a bird is a breathtaking example of the way Fischer uses the man-made world to explore the subjectivity of birds, with ‘pared to necessity’ describing the bird in flight, doing as it must beneath the drive of nature. Birds and landscapes are, also, often linked to history and mythology, demonstrating the immense knowledge possessed by the poet and his skilful ability to use it as a device in his work. we dream of golden palaces forged by Hephaestus. 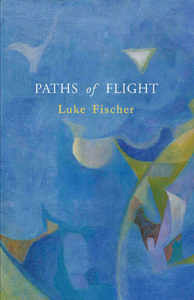 A stunning achievement within a book of many, the poetry of Luke Fischer is unquestionably diverse and unique. It is testament to his range, skill and depth that he can evoke and marry the natural landscape with the internal landscape, while also exploring many states of mind, and aspects of what it means to be human. Intelligent and filled with a deep sense of humanity, Paths of Flight shows us there is as much need to look into the sky for meaning as there is to simply look into the sky for beauty. ROBBIE COBURN is a Melbourne-based poet. His second full-length The Other Flesh is due out in early 2017.